RTG software is fast, sharp, and easy to use. 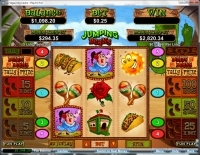 The casinos that use RTG tend to be generous with bonuses, although some have less than perfect reputations. 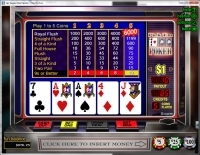 RTG offers both a download and Flash casino. This review should apply equally to both, but the photos, unless otherwise stated, are from the download casino. 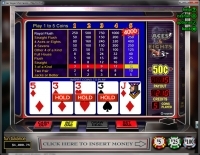 One of RTG casino's unique features is many of the games have rules or settings that are configurable by the casino manager. For example, in video poker, the pay tables are configurable. 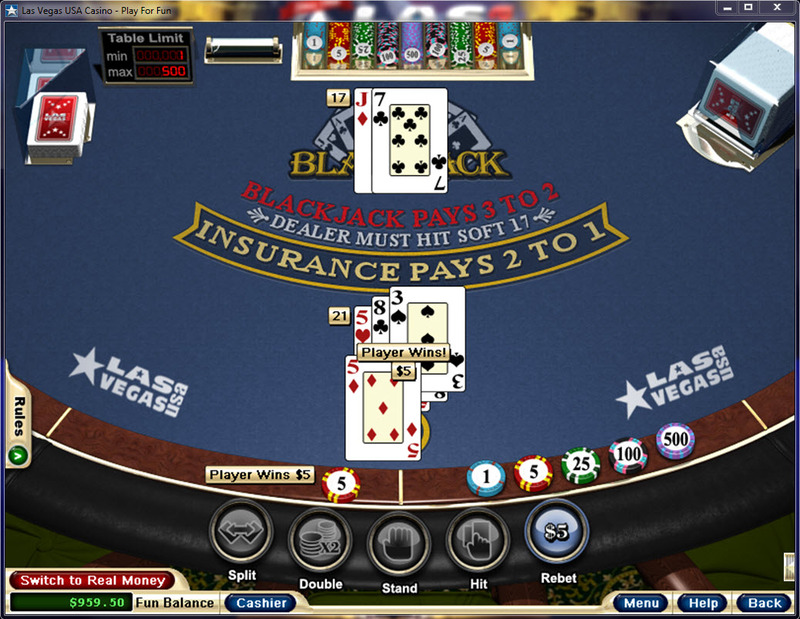 In blackjack, the number of decks and surrender feature are also configurable. 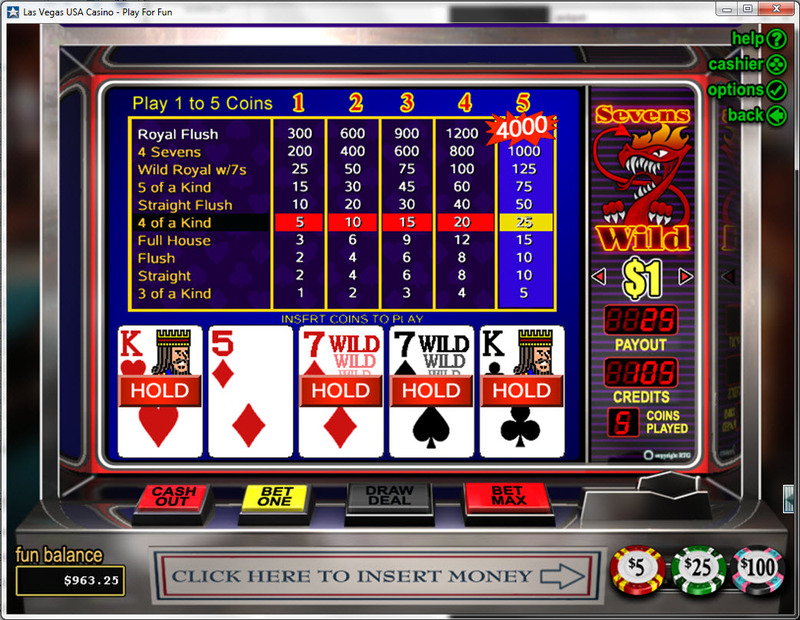 With the slot machines, there are multiple unknown settings for the return percentage. 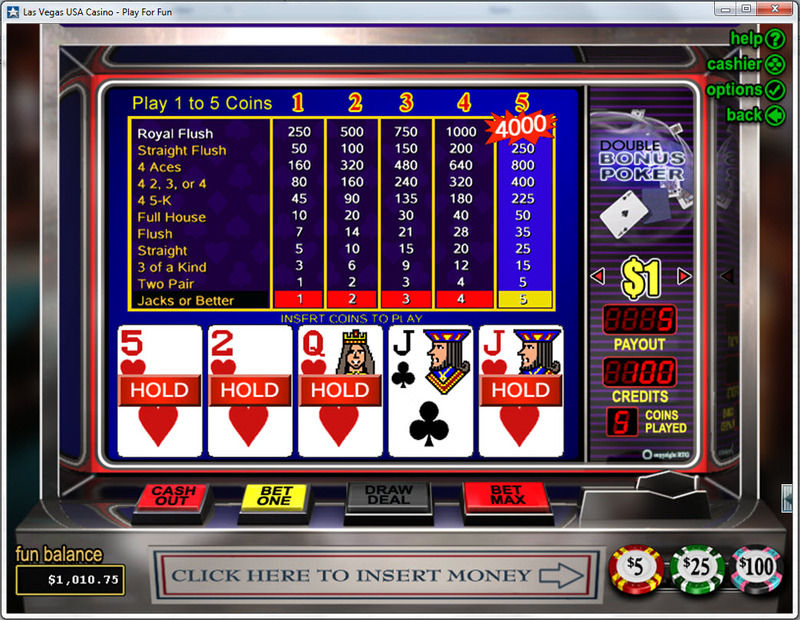 For the most part, the game selection should be almost the same between the Flash and download casinos. 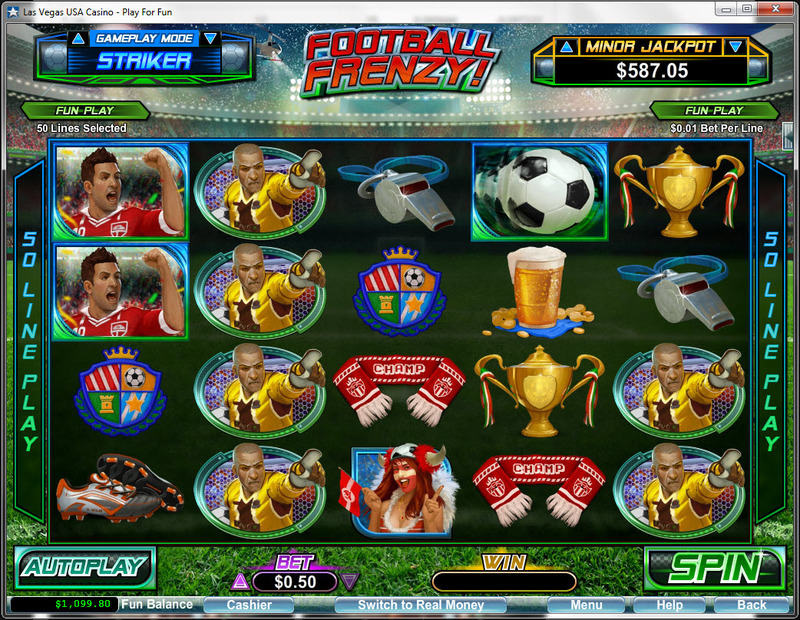 Other than some slots not being available in Flash, the game selection seems the same. 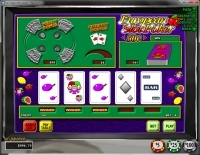 As with any casino software, the graphics are a little sharper and the speed faster in the download casino. 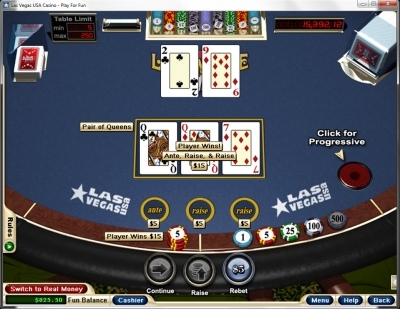 The following screenshots show side by side both versions. With any image in this page, click on it for a larger version. For superstitious players, there is a history board available by clicking the "history" button on the left of the screen. There are two bingo games, Bonus Bingo and Roaring Twenties Bingo. They have features like multipliers, extra balls, and bonuses, whose rules are not entirely quantified. Thus, I can't perform an analysis. So, for now, you're on your own with the RTG bingo games. 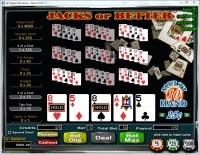 RTG has a number of blackjack games to choose from. 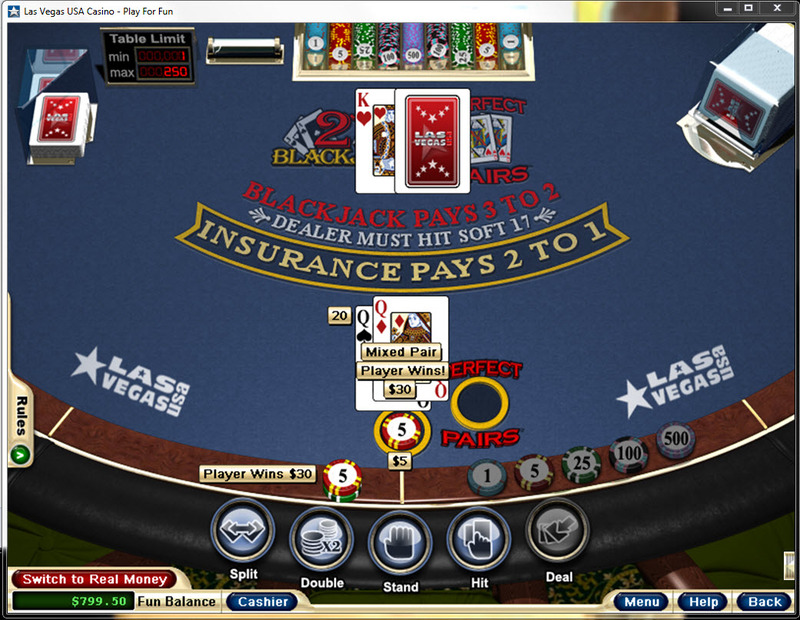 These are the rules for their standard blackjack game. I believe the same rules are followed in the Match Play, Perfect Pairs, and Suit 'Em Up games, which also tack on side bets. Configurable number of decks. 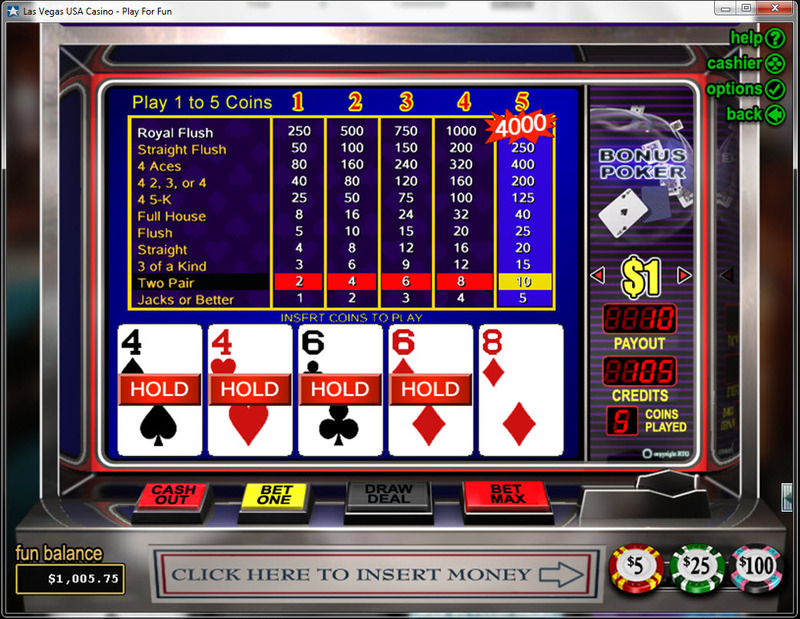 Most casinos seem to opt for six. 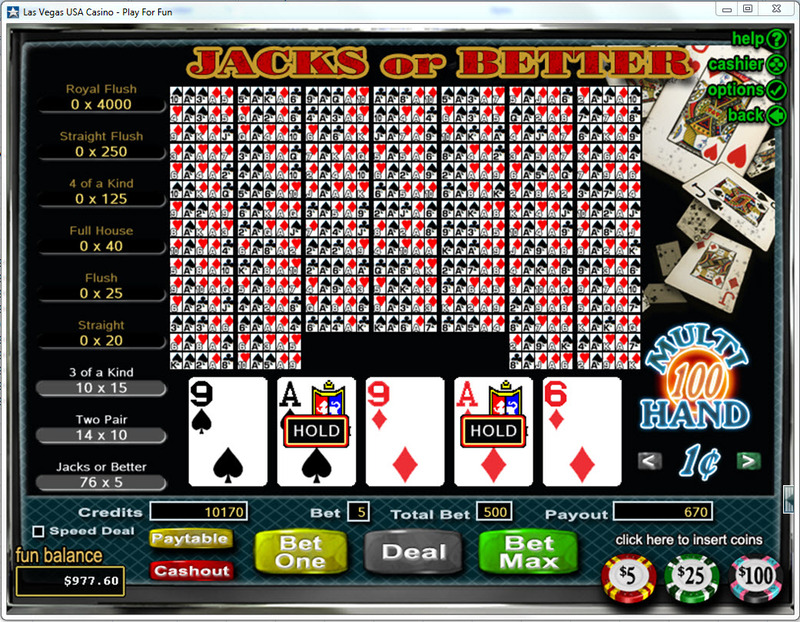 Split two times (to three hands), except re-splitting aces not allowed. 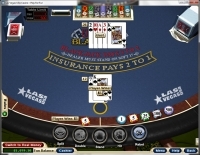 Player only loses original bet if dealer has blackjack. Late surrender is a configurable option. 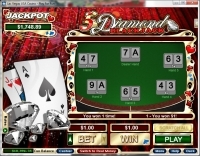 Usually it is not enabled but some casinos do allow it, such as Bodog. 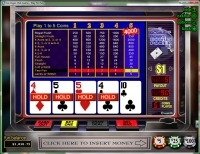 For me, the most annoying thing about RTG software is the rule screens don't indicate how many decks are used in blackjack and nobody in support ever seems to know the correct answer. 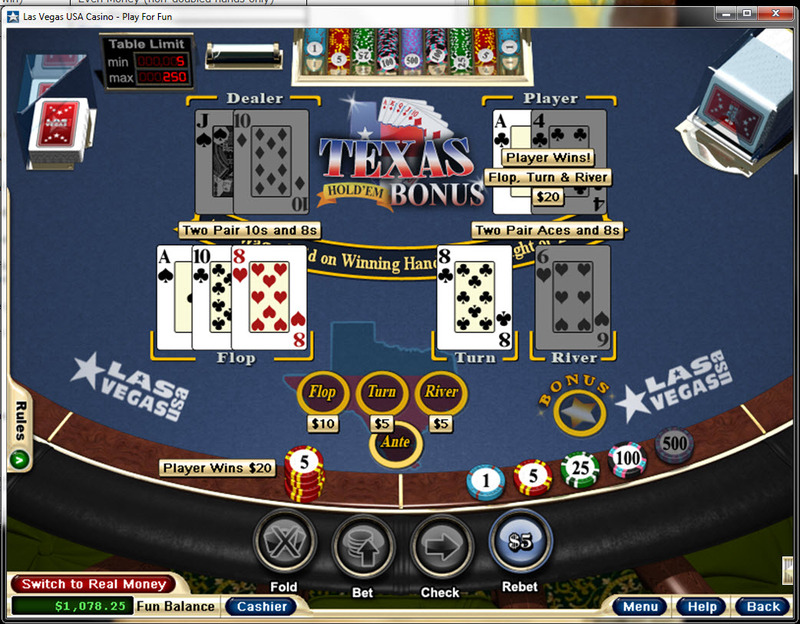 However, after playing RTG casinos for over a decade, I strongly believe most casinos opt to use six decks. Once I was so frustrated over this important omission in the rules that I created enter page on how to test for the number of decks. 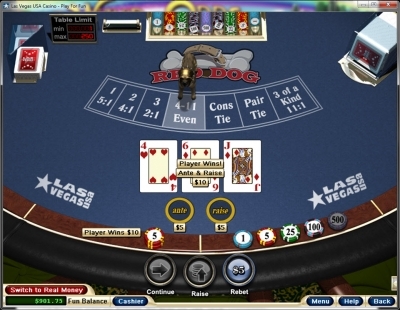 The following tables display the basic strategy for Real Time Gaming casinos, for two and 4-8 decks. The house edge depends on the configurable rules as follows. 2 decks, surrender allowed: 0.34%. The following table shows the Blackjack games available in alphabetical order. 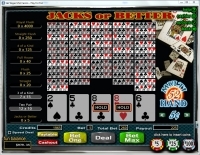 This is the same as the conventional blackjack game described above with the Perfect Pairs side bet. 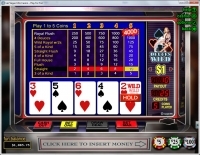 The side bet follows the 25-12-6 pay table. 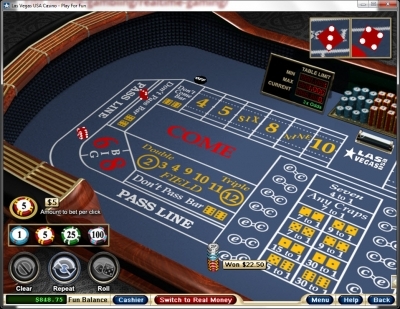 The house edge on the side bet depends on the number of decks, as shown in the following table. Unknown number of decks, but I think most casinos opt for eight. Dealer does not take a hole card. 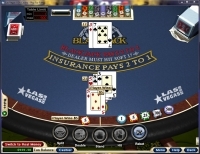 If the dealer gets a blackjack, then the player loses everything, including doubles and splits. Player may double on hard 9 to 11 only. 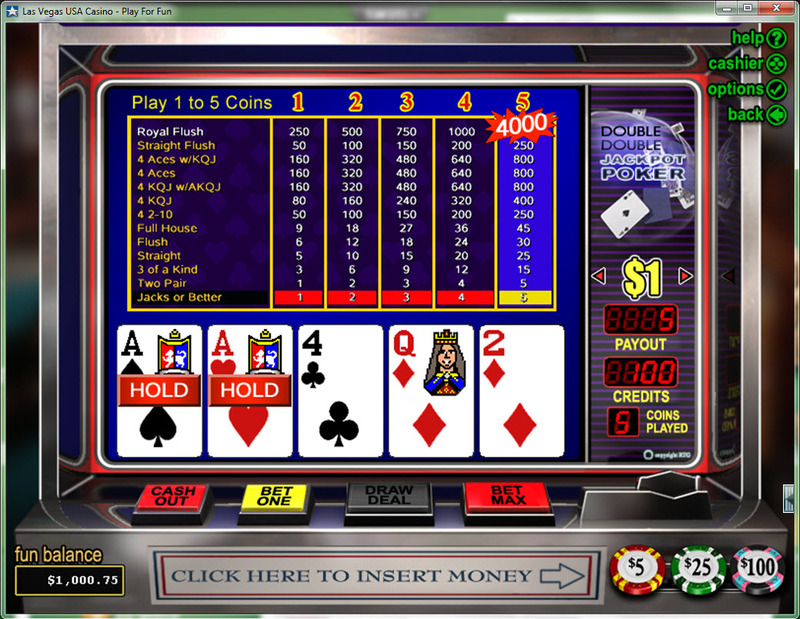 Player may split to three hands, except aces may be split once only. 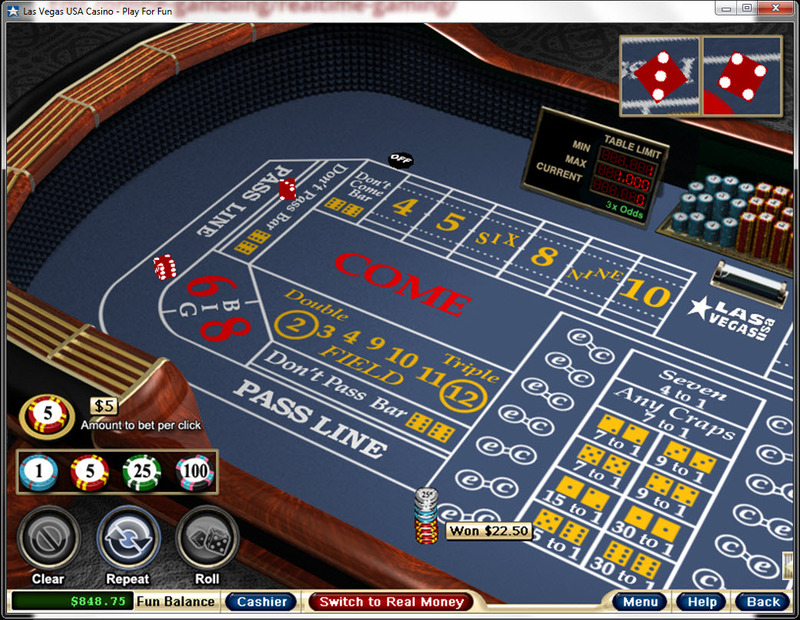 Based on my blackjack house edge calculator, the following table shows the house edge according to the number of decks. 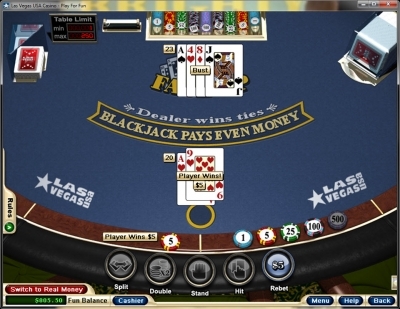 The following strategy is appropriate of the European blackjack rules, assuming four or more decks. 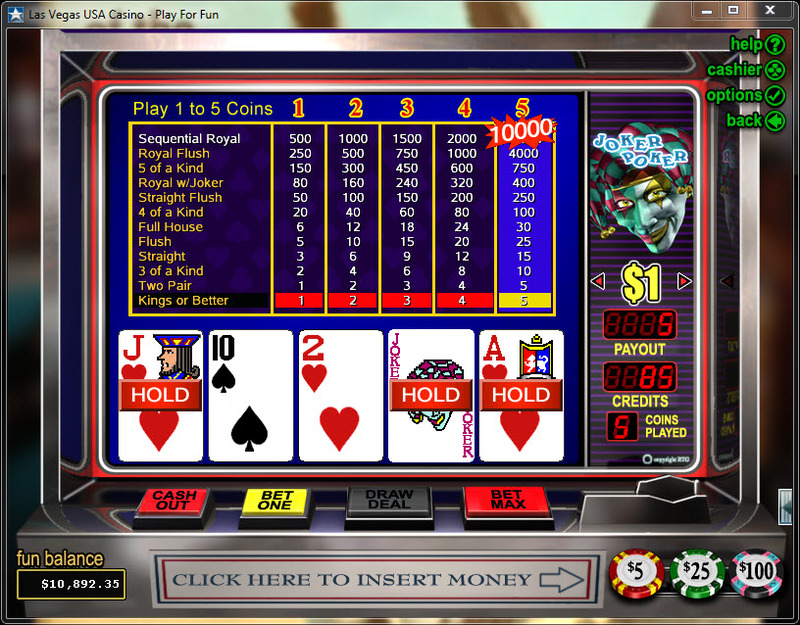 I don't think any RTG casinos offer this game any longer. However if you do see it, please refer to my page on Caribbean 21 and let me know where you found it. 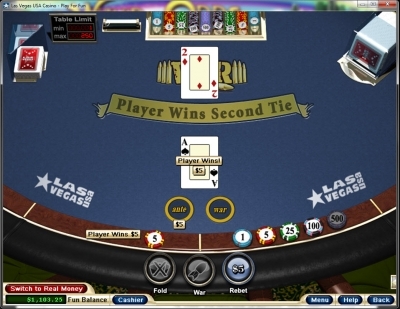 Standard Casino War rules are used where the player wins on a tie after a tie. One deck of cards is used for a house edge of 2.42%. Here are the craps rules and payouts of RTG craps. Odds allowed: This seems to be configurable. Two settings I know of are 2x and 3x. In both taking and laying the odds, the max bet is relative to the amount bet on the pass, come, don't pass, or don't come. One of these days, I hope to see an Internet casino understand that when laying odds the multiple is supposed to be relative to the win, not the bet amount. 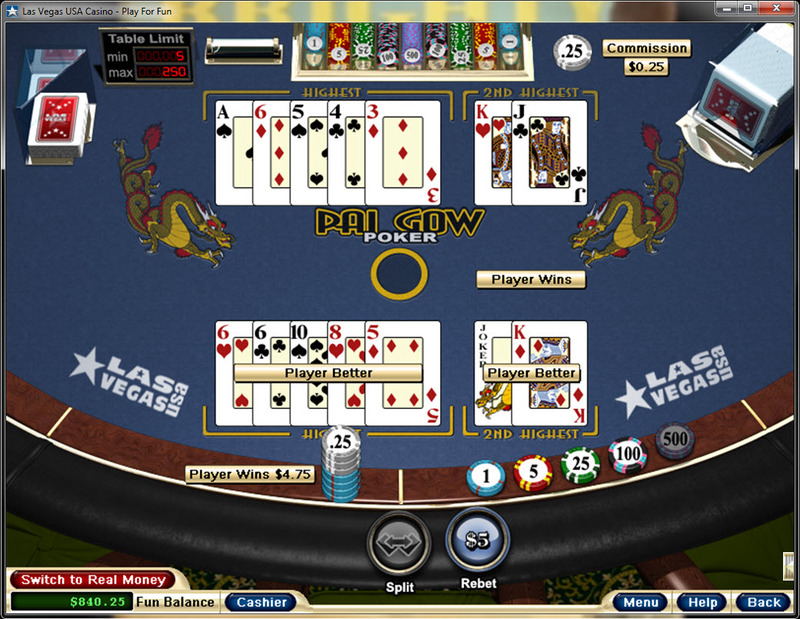 Field: The win on the 12 seems to be configurable at 2 to 1 or 3 to 1. At 2 to 1, the house edge is 5.56% and at 3 to 1 is 2.78%. Place bets: Standard rules. House edge is 6.67% on the 4 and 10, 4.00% on the 5 and 9, and 1.52% on the 6 and 8. Buy bets: A 5% commission is charged on wins based on the bet amount. 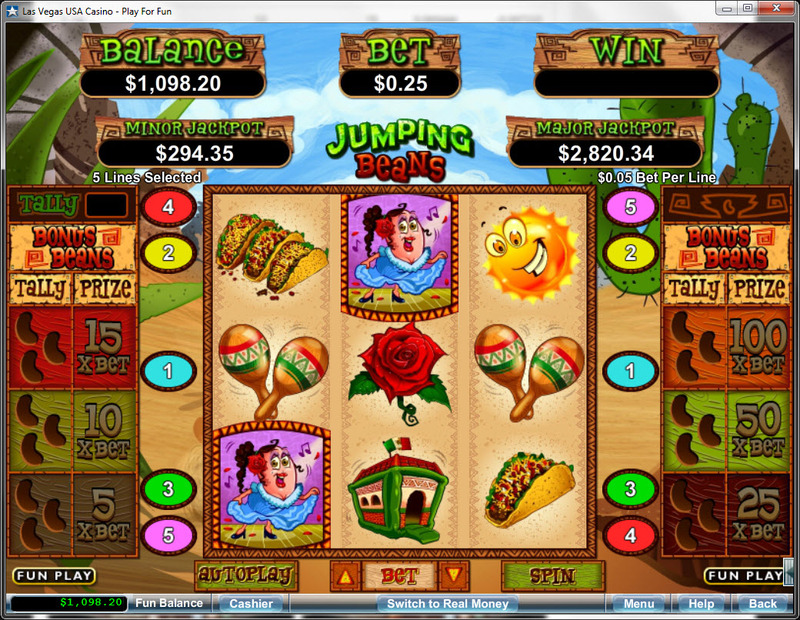 For example, a $100 buy bet on 4 would pay $195 (2 to 1 less 5% of $100). 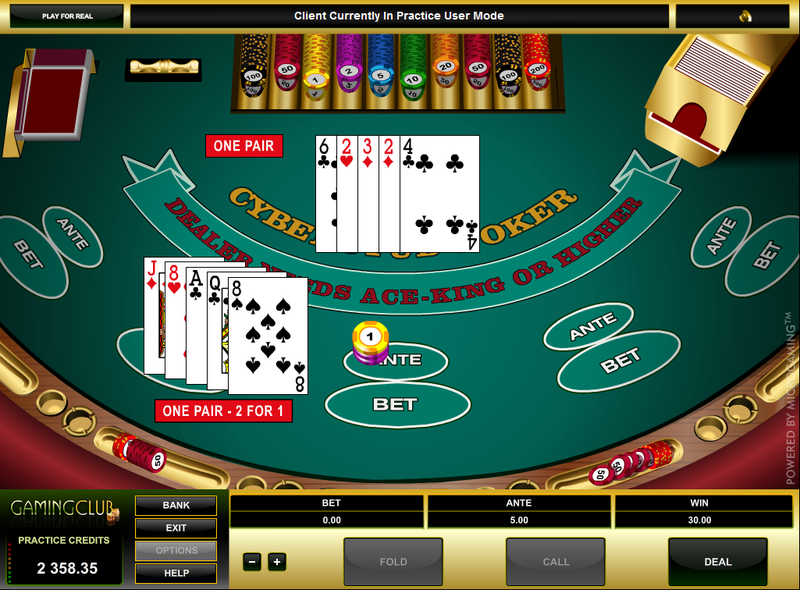 House edge is 1.67% on the 4 and 10, 2.00% on the 5 and 9, and 2.27% on the 6 and 8. Note that buy bets have a lower house edge than place bets on every number except the 6 and 8. 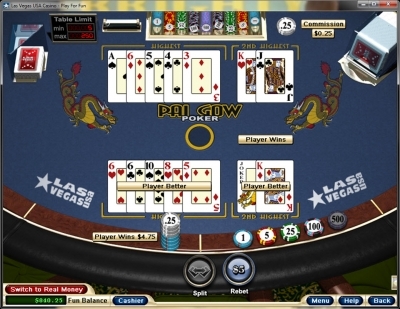 Point of 4 or 10: Commission of 2.5% of the win, for an effective payoff of 39 to 80. House edge is 0.83%. 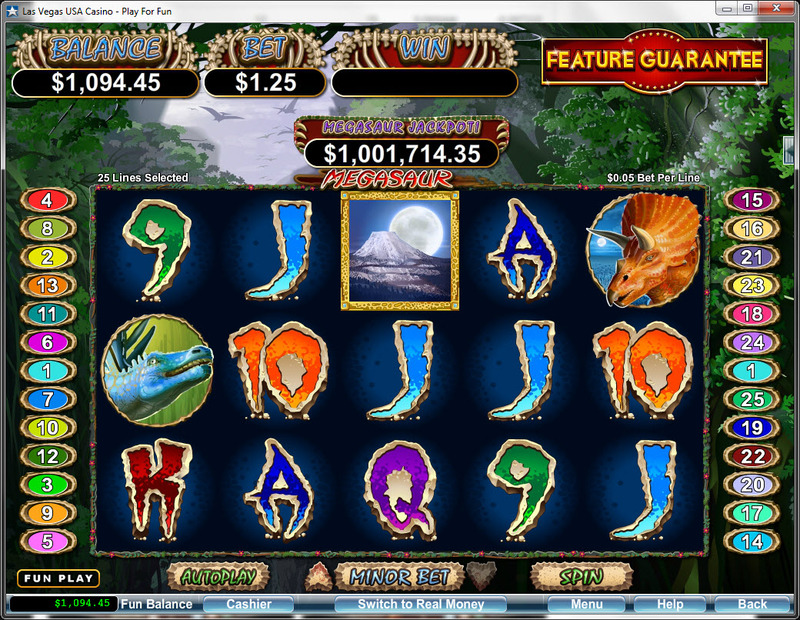 Bet in increments of $20 to avoid getting rounded down. 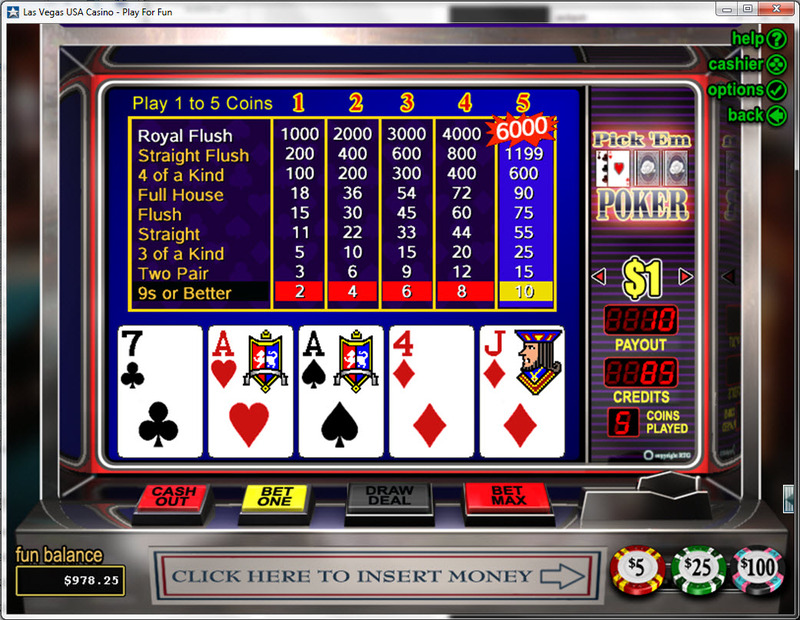 Point of 5 or 9: Commission of 2.5% of the bet, for an effective payoff of 77 to 120. House edge is 1.50%. 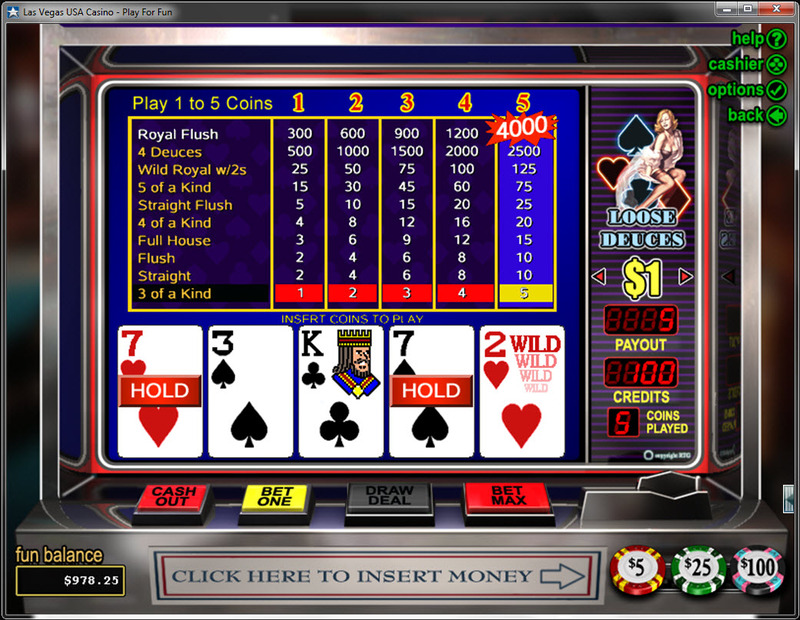 Bet in increments of $30 to avoid getting rounded down. 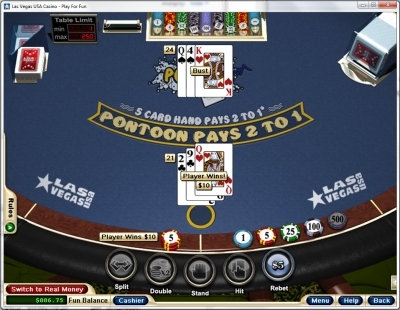 Point of 6 or 8: Commission of 4% of the win, for an effective payoff of 4 to 5 (the same as the place to lose bet on 6 or 8). House edge is 1.82%. 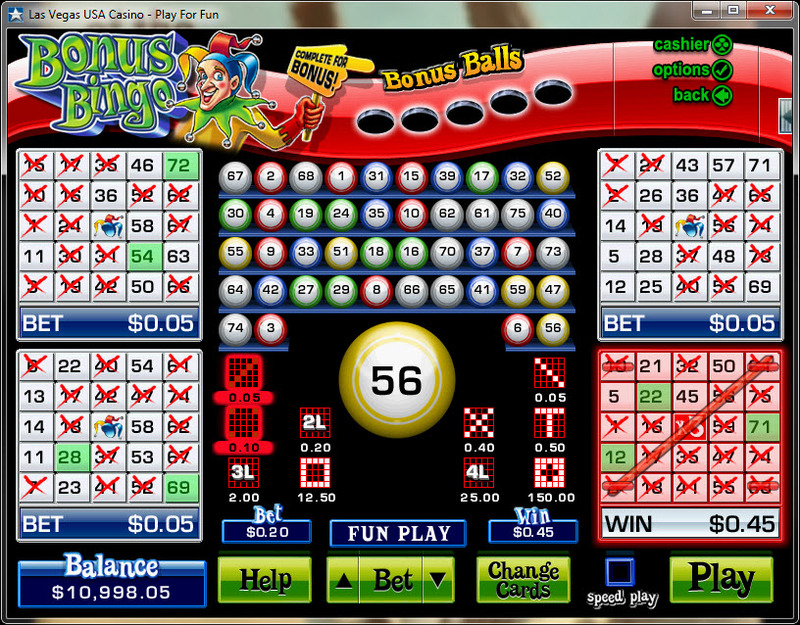 Bet in increments of $5 to avoid getting rounded down. So note how the house edge on lay bets is lower than don't place bets on every numbers except 6 and 8, in which case it is the same. 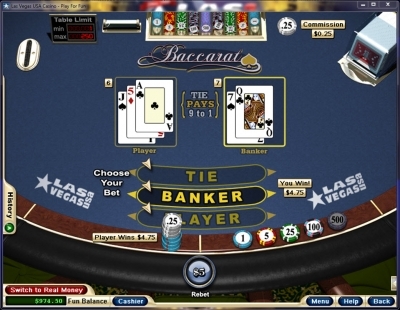 Proposition bets: All the standard pays are followed, including 15 to 1 on easy hops, 30 to 1 on hard hops, 4 to 1 on any seven, and 7 to 1 on any craps. Due to the high house edge on all these bets, I would recommend having nothing to do with them. 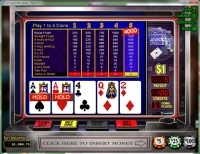 Big 6 and 8: These sucker bets are the same thing as the place bets on 6 and 8, except they pay even money instead of 7 to 6. Stay away! Warning: Winnings are rounded down to the nearest quarter. 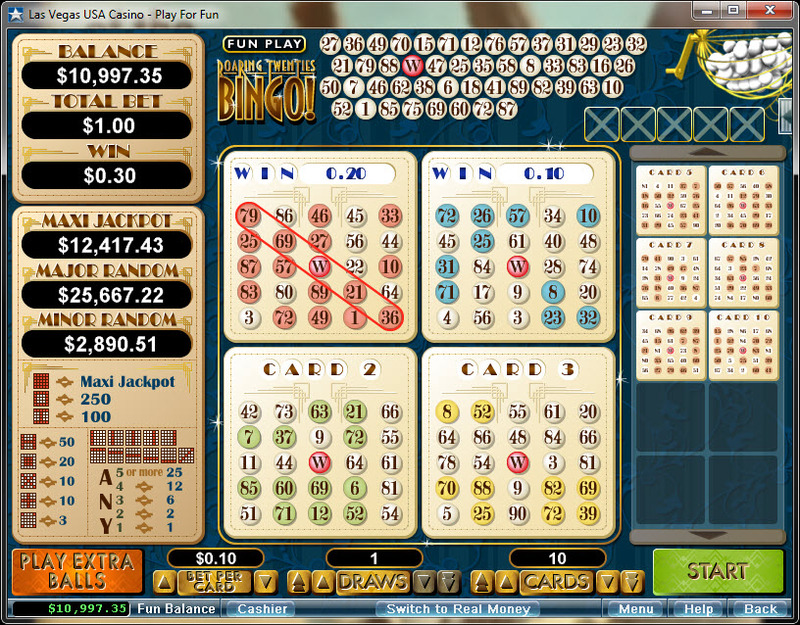 For this reason, when taking the odds you should bet in increments of $5 on the 6 and 8 and $1 on all other numbers. Lay bets should be in increments of $20 on the 4 and 10, $30 on the 5 and 9, and $5 on the 6 and 8. According to Norm Wattenburger, the house edge is 0.90%. 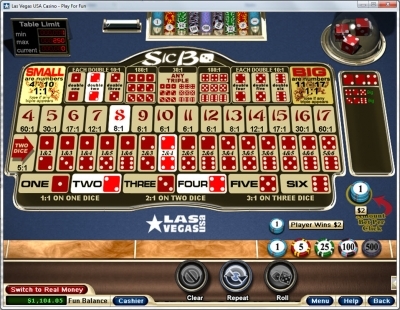 The player may choose 1 to 15 numbers. 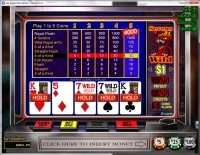 The following pay table is for the Las Vegas USA casino. I imagine that others are available. 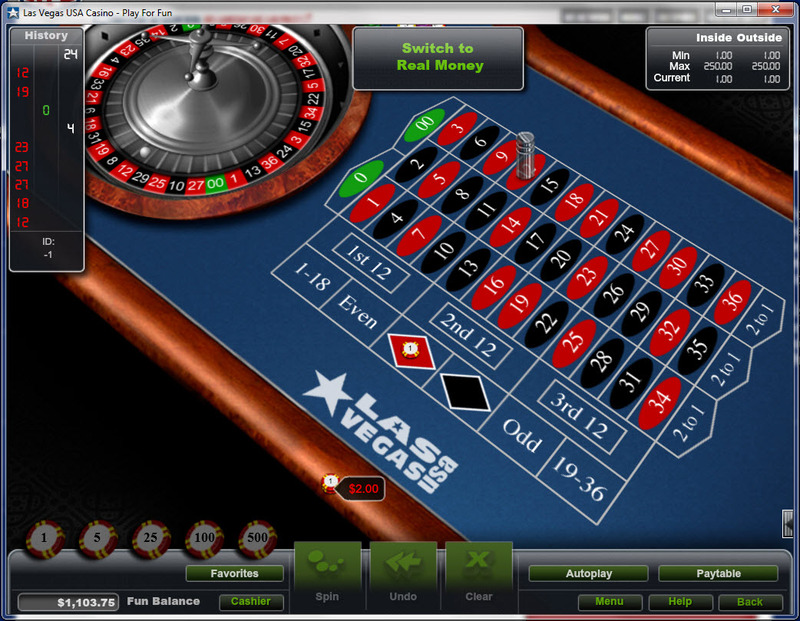 The following table shows the return and hit frequency for the Las Vegas USA pay table above. Note the highest return is on the pick-11 at 86.75%. This is another name for Let it Ride. 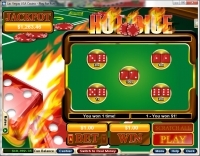 The usual rules and pay table are used, which results in a house edge of 3.51%, based on single unit bet. 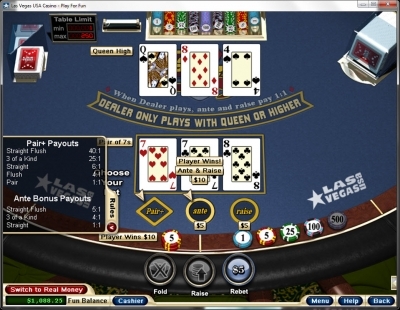 There is also a $1 progressive side bet, which has the same pay table as that in Caribbean Stud Poker (see above). This is Spanish 21 under an assumed name. In this game the dealer hits a soft 17 and redoubling is not allowed. I assume that six decks are used. The only rule change is that three suited sevens against a dealer seven, without doubling or splitting, pays 40 to 1. The house edge is about 0.81%. 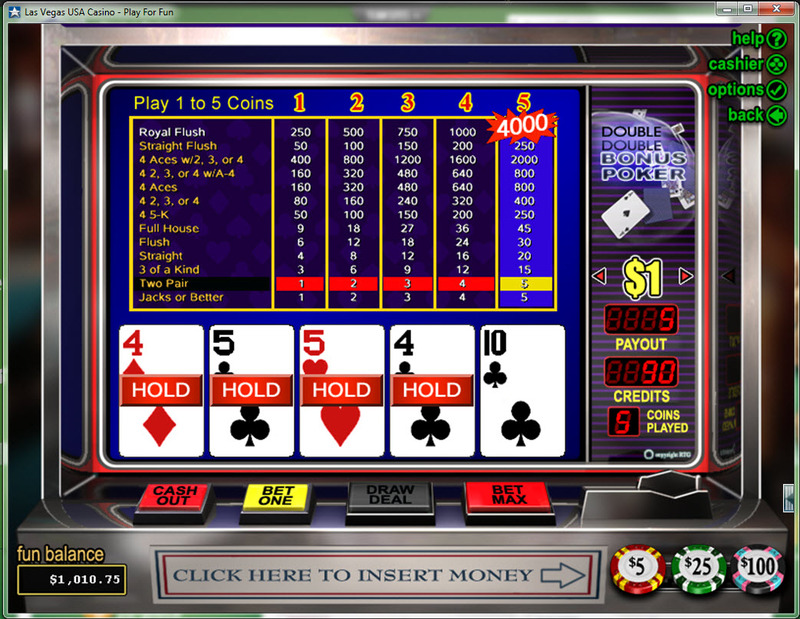 This is the same thing as Casino Hold'em. The liberal 100/20/10/3/2 pay table is used, at a house edge of 2.16%. 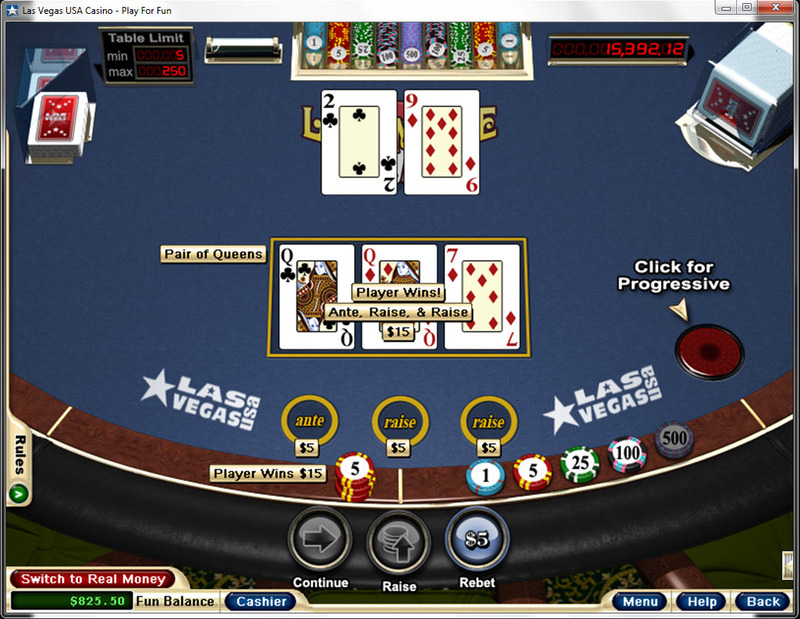 In lieu of the AA+ side bet, there is a progressive side bet on the five flop cards. 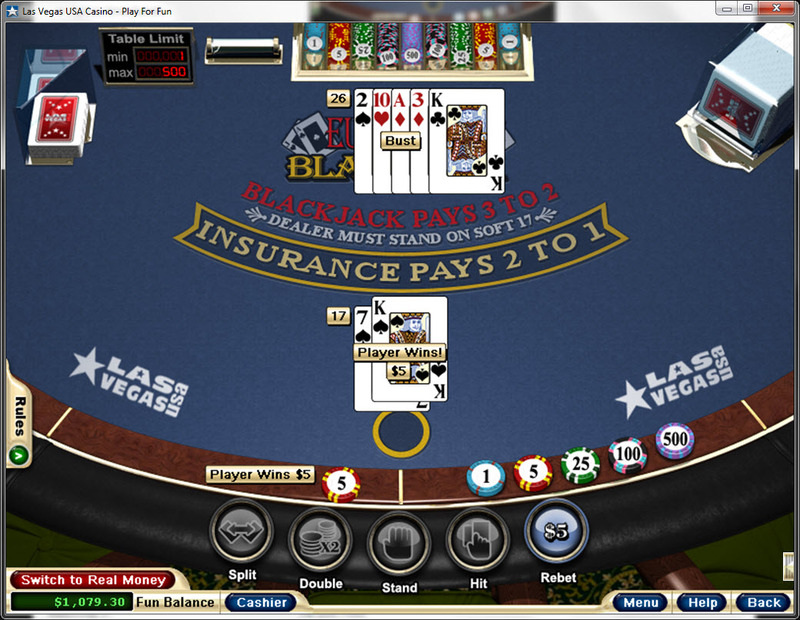 The same 100%/10%/$500/$100/$75 pay table is used as in Caribbean Stud Poker (addressed above). 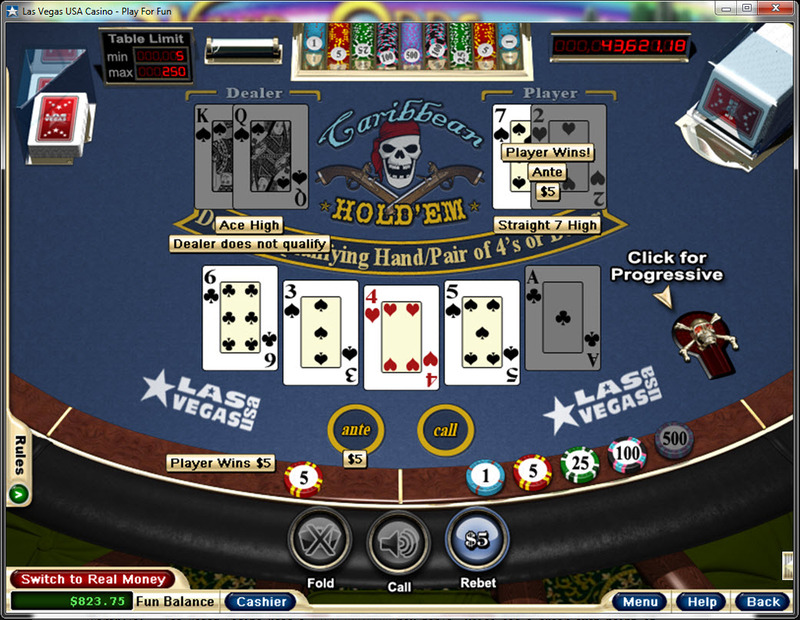 For more information, please see my page on Caribbean Hold 'Em. You can also see a video of my playing on YouTube. Note the last hand to see my flush get paid even money only on the Ante. 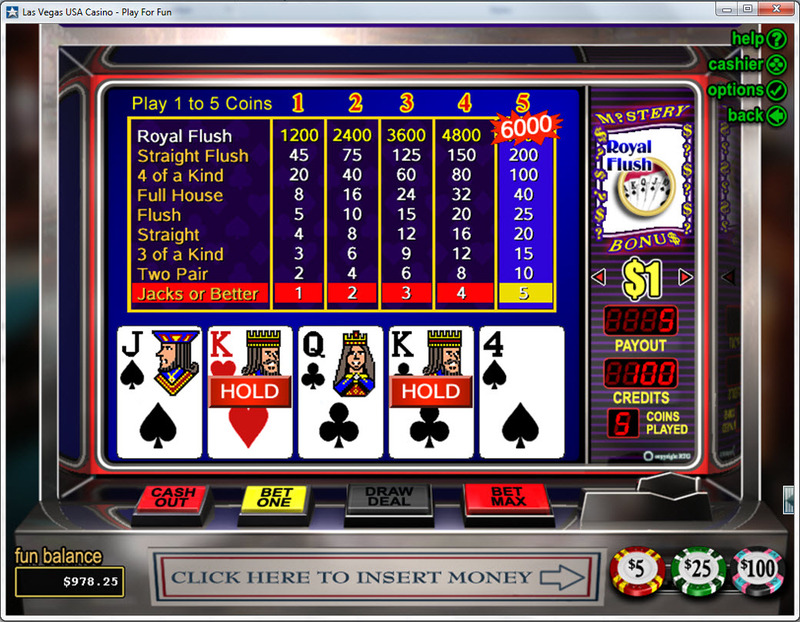 RTG follows the usual U.S. pay table, except a royal flush pays 200 instead of 100. This lowers the house edge from 5.22% to 5.21%. This pay table returns 41.152%, plus 2.9242% for each $10,000 in the jackpot meter. 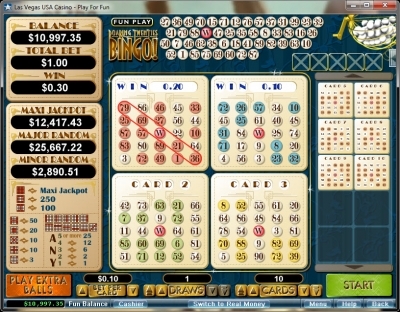 The break even point, with zero house edge, is at a jackpot of $201,241.58. 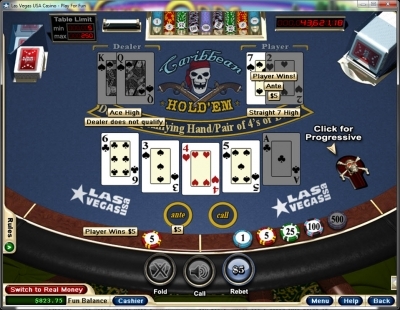 For more information about Caribbean Stud Poker please visit my Caribbean Stud Poker section. 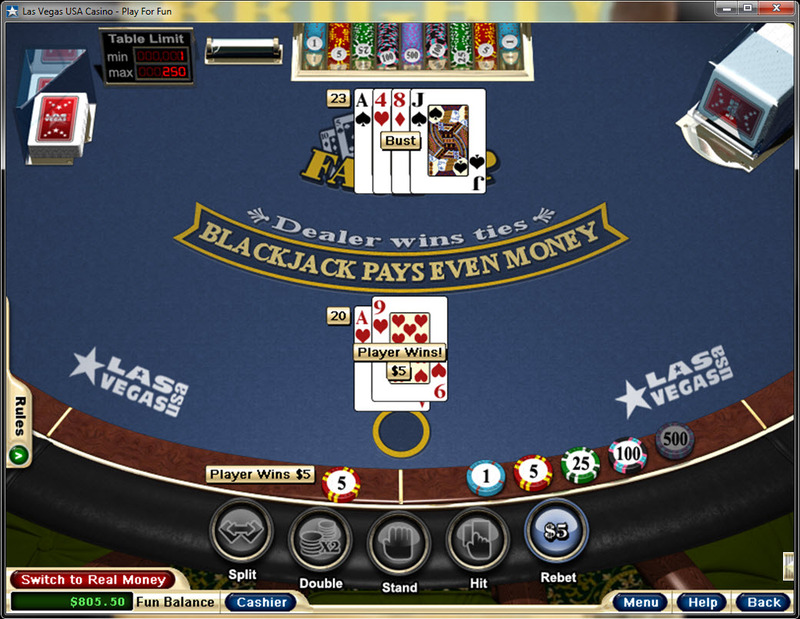 The dealer is always the banker and the usual 5% commission is charged on wins. The A-5 straight is the second highest. 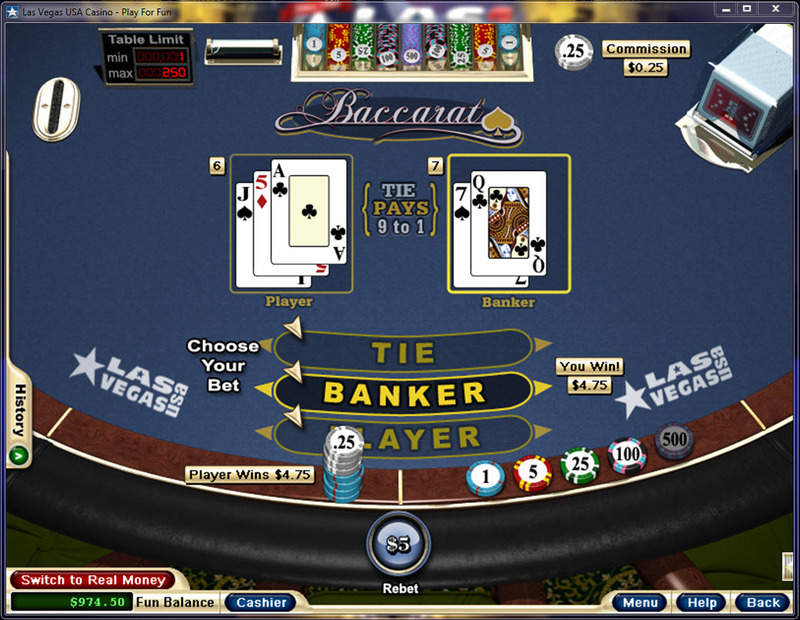 The cards are conveniently arranged in order and the game will warn the player if he fouls his hand. There is no "house way" button. One noteworthy thing about this game is the very elaborate house way followed by the dealer. The house edge under the RTG rules is 2.86%. Warning: Winnings are rounded down to the nearest quarter. For this reason, you should be in increments of $5. 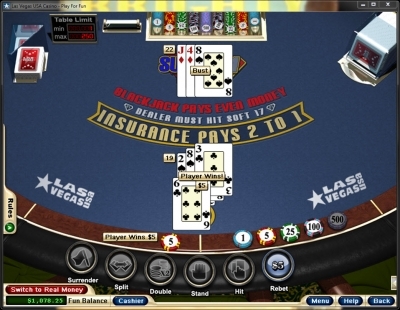 The poker variant features the liberal Las Vegas version of the rules, where the player needs a winning straight only to win the Ante bet. This results in a house edge of 2.04%. 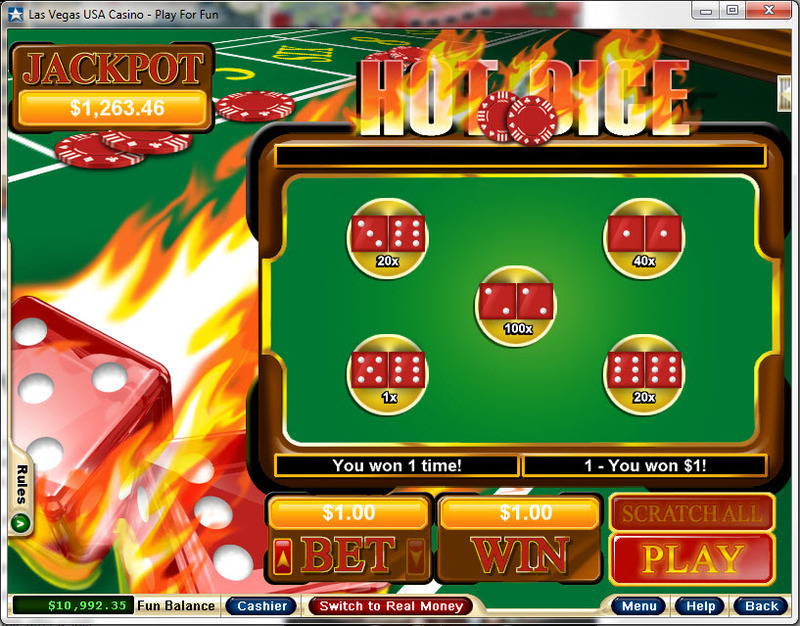 On the Bonus Bet they follow the "Atlantic City" pay table that goes 30-25-20-15-10-5-3, which has a house edge of 8.90%. 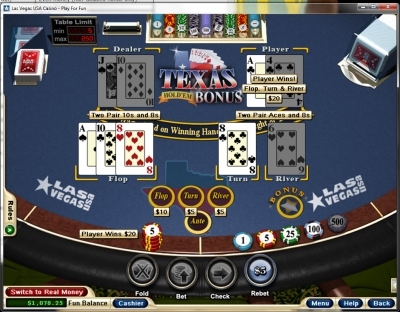 Please see my page on Texas Hold 'Em Bonus Poker for more information about this game. 1-4-6-30-40: House edge of 2.32%. 1-4-6-25-40: House edge of 3.49%. This is a blackjack variant that should not be confused with Australian pontoon/Spanish 21. RTG Pontoon is loosely based on blackjack. There are too many rules to mention, so please visit my RTG Pontoon page for more information. The house edge is 0.38%. The usual Red Dog rules are followed. I'm told that two decks are used, for a house edge of 3.08%. 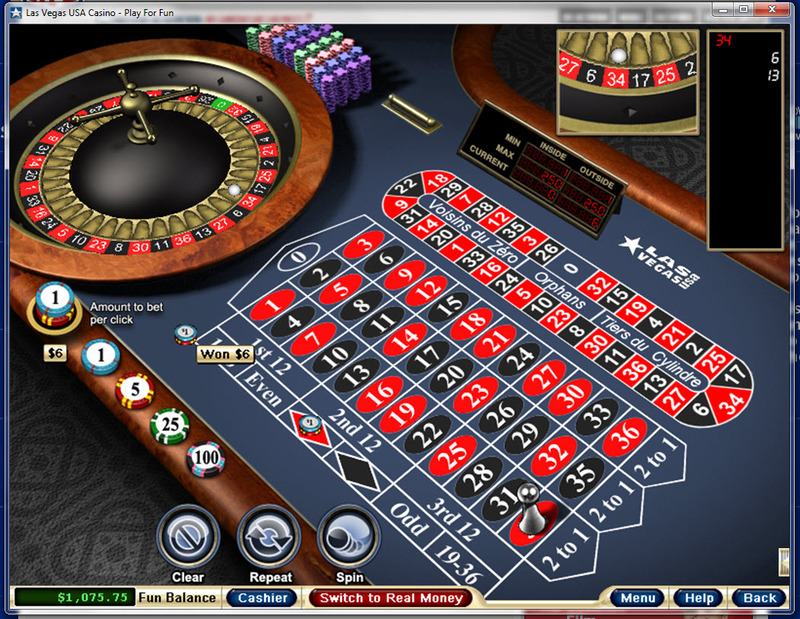 American roulette: Double-zero wheel. House edge of 5.26% on all bets except the five-number bet, which is 7.89%. 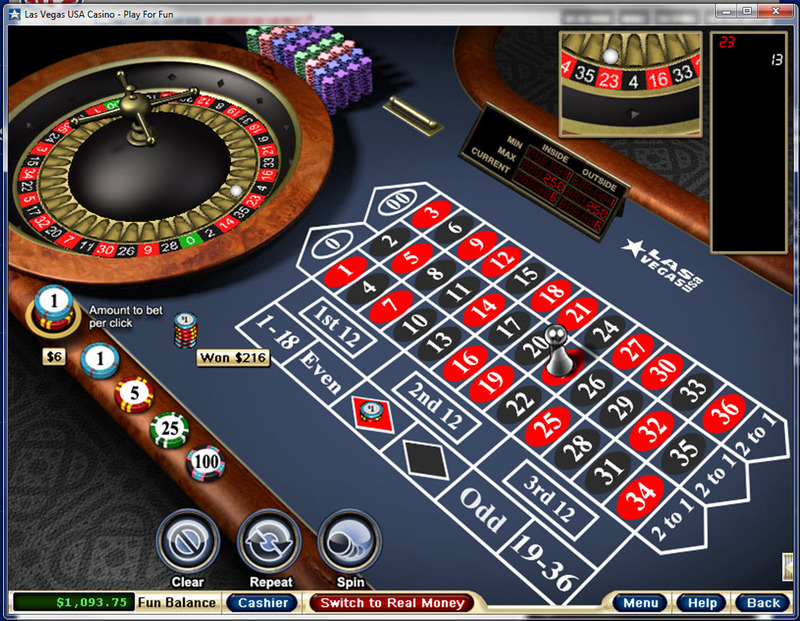 New American roulette: Same as American roulette rules. Just a different look to the game. European roulette: Single zero wheel. It also offers the neighbors and orphans bets. House edge of 2.78%. 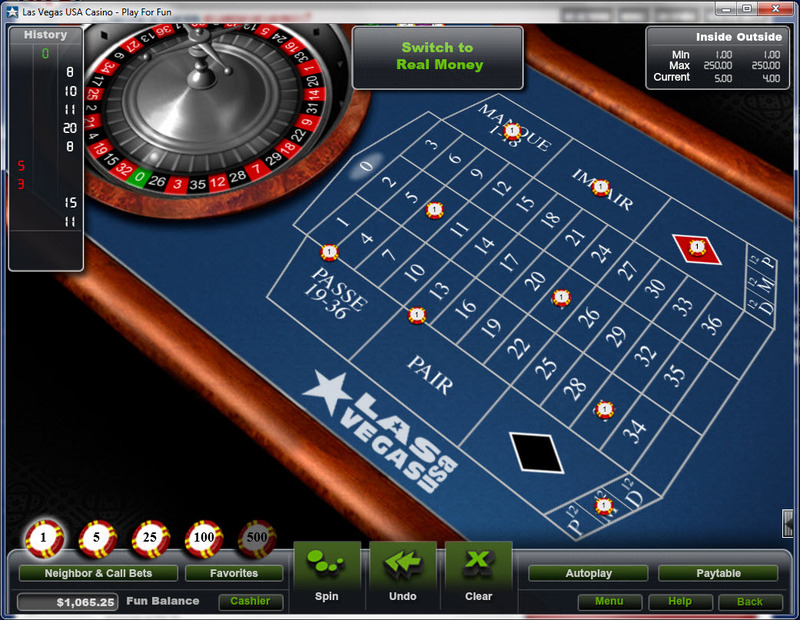 French roulette: Single zero wheel with the "la partage" rule, which states any even money bet will lose zero only if the ball lands in zero. House edge of 1.35% on the even money bets and 2.78% on all others. 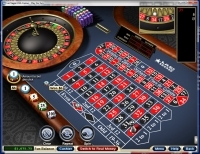 If you must play roulette, there should be no reason to play anything other than French Roulette, preferably sticking to even money bets. 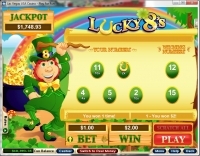 RTG offers four scratch card games, the three pictured below plus Magic 7's. The rules are not quantified, so I have no idea what you are up against mathematically. So, with the scratch cards, you're on your own. RTG follows the Macau pay table for sic bo. The following table shows the win for each bet, probability of winning, and return. 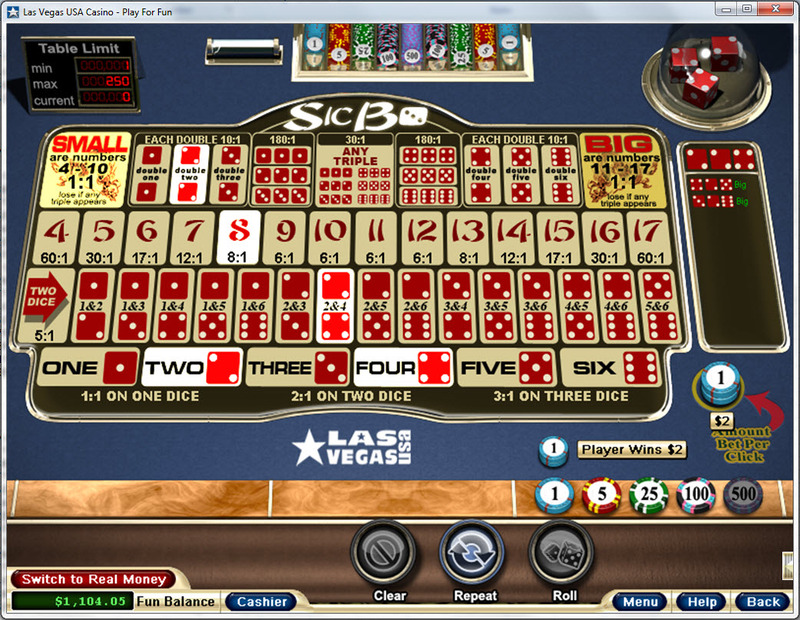 As always with sic bo, I recommend sticking the the small and large bets, with the lowest house edge of 2.78%. 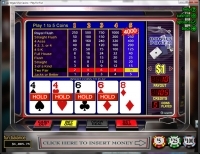 It is my understanding the casino operator has three settings to choose from on how loose or tight he wishes to set the slots. Naturally, they don't usually disclose their decision. There is a nice variety of about 50 slots. 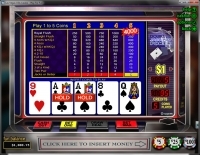 Most are video slots but some are classic three-reel games. 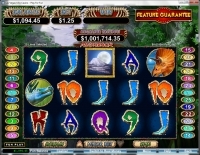 Plenty have bonus rounds and several have progressive jackpots. 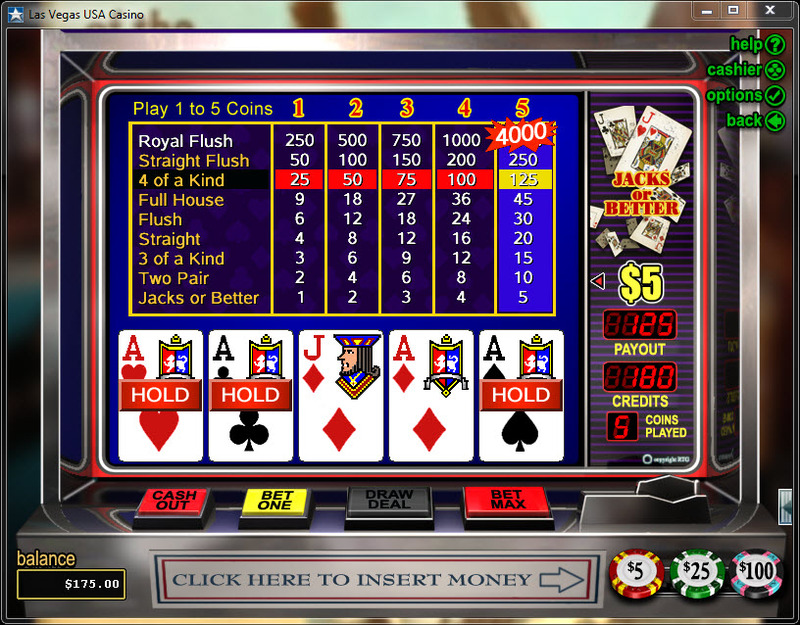 Here are screen shots of six of their games. 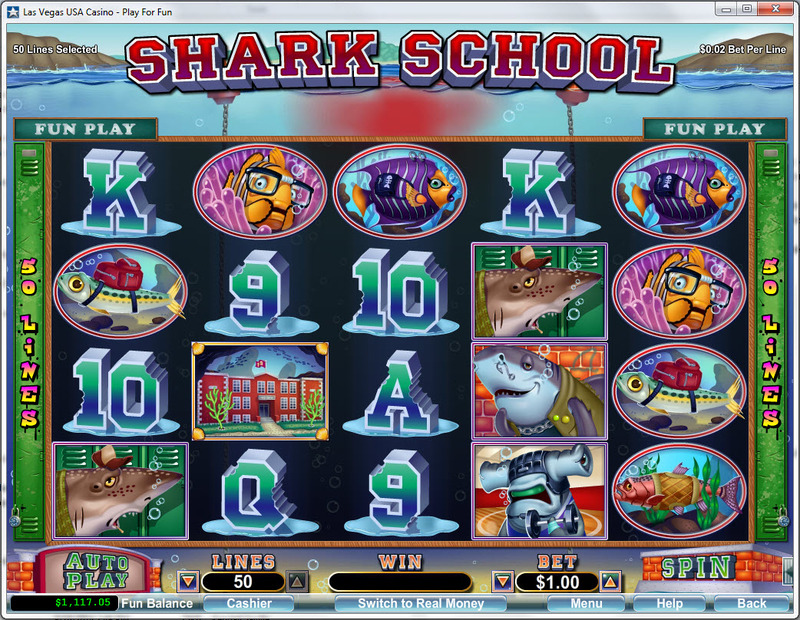 I would like to know why the Naughty or Nice Spring Break slot machine has graphics and sound pertaining to Christmas. When last I checked, spring break was around Easter. 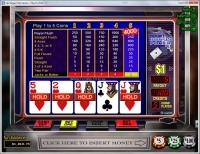 Configurable number of decks but most casinos likely opt for six. Dealer hits a soft 17. Player may double after a split. 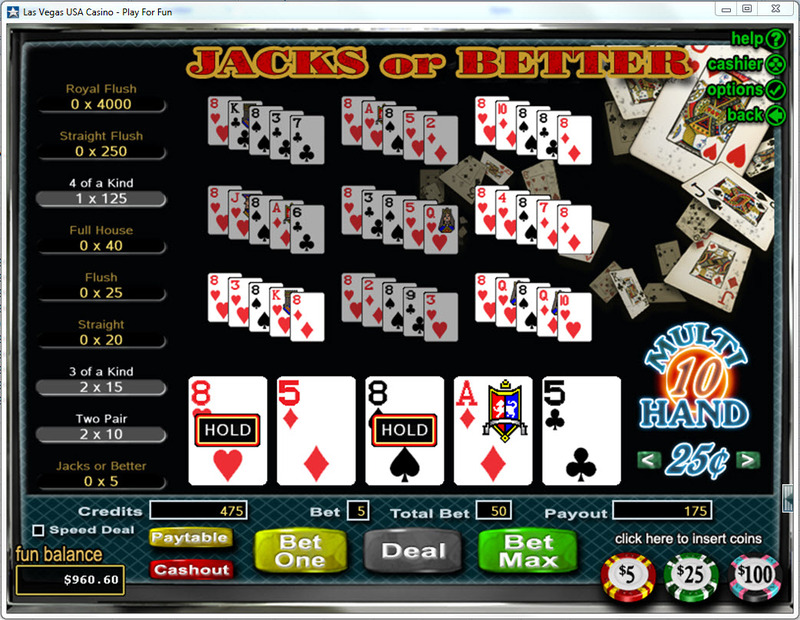 Player may re-split to up to three hands, including aces. 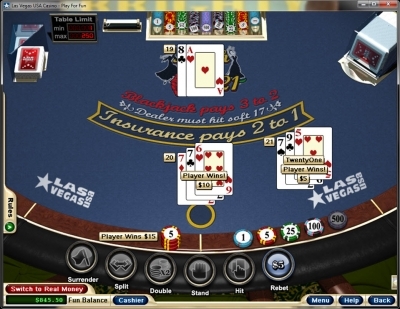 Player may hit and double down to split aces. Player may double on any number of cards. Player may take late surrender on any number of cards. Player may surrender half of total bet after doubling, what is called "Double Down Rescue" in Spanish 21. 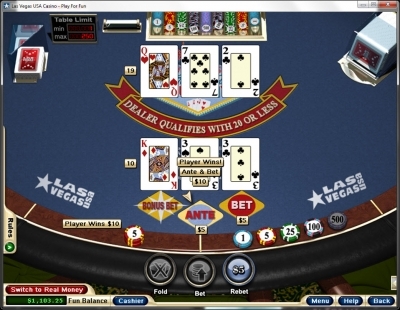 A player hand totaling 20 or less, consisting of six cards or more, except after doubling*, automatically wins. 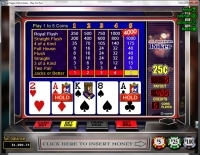 A player hand of 21 points, consisting of 5 cards or more, except after doubling*, pays 2 to 1 instantly. 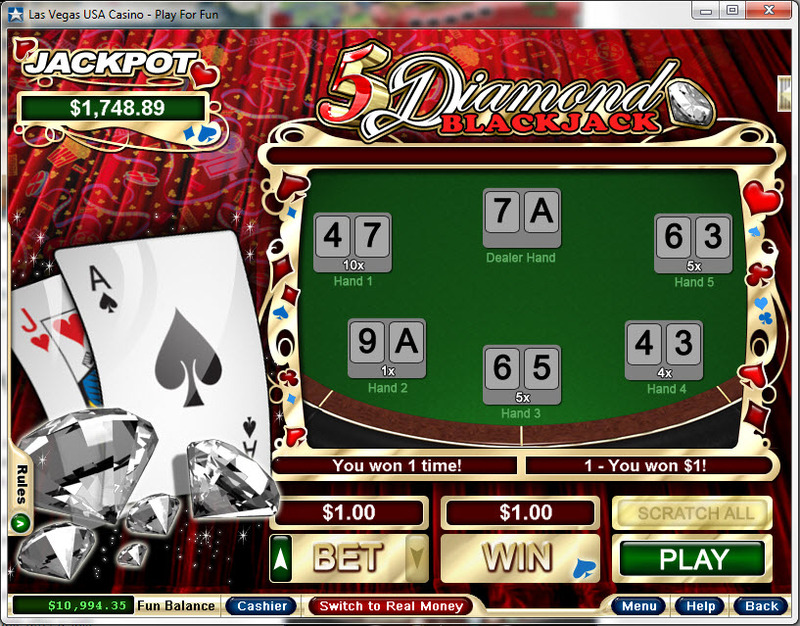 A player blackjack in diamonds pays 2 to 1, all other blackjacks pay even money. 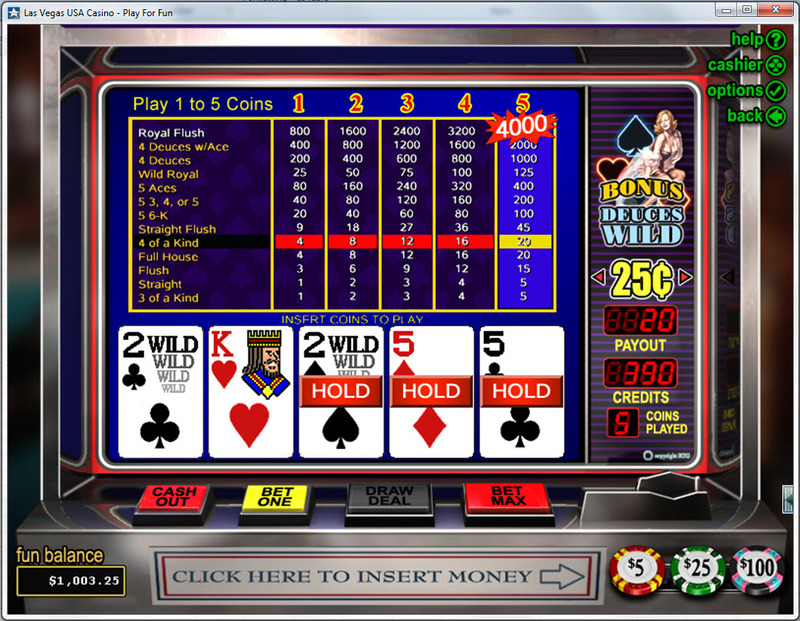 Please note that doubling will void any special rules for 5-card and 6-card hands. 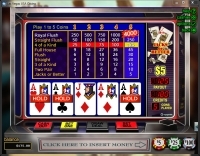 Vegas Three Card Rummy is a game I've seen only at Internet casinos using RTG and Cryptologic software. I've never seen it in a land casino. 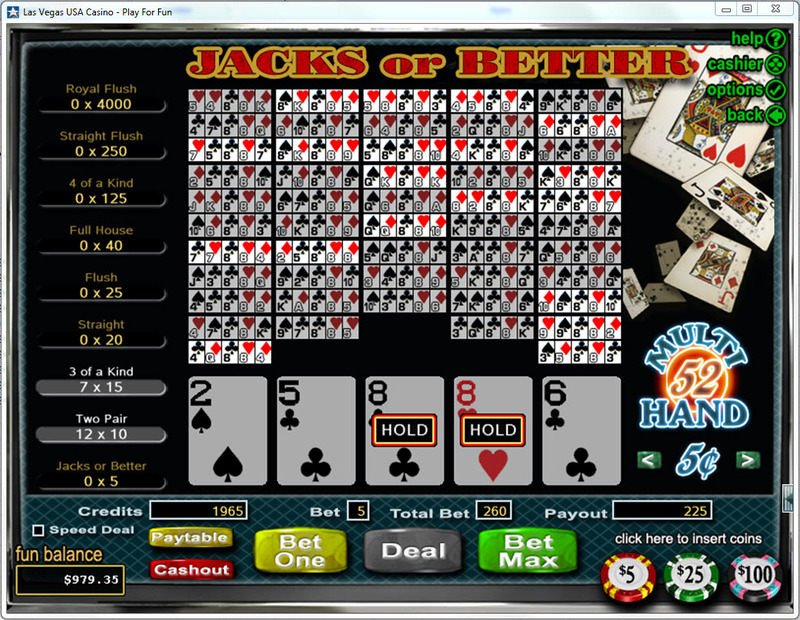 The game is similar to Three Card Poker, but hands are scored much differently, and the odds are better. The house edge is 3.23% on the Ante and 3.54% on the Bonus. 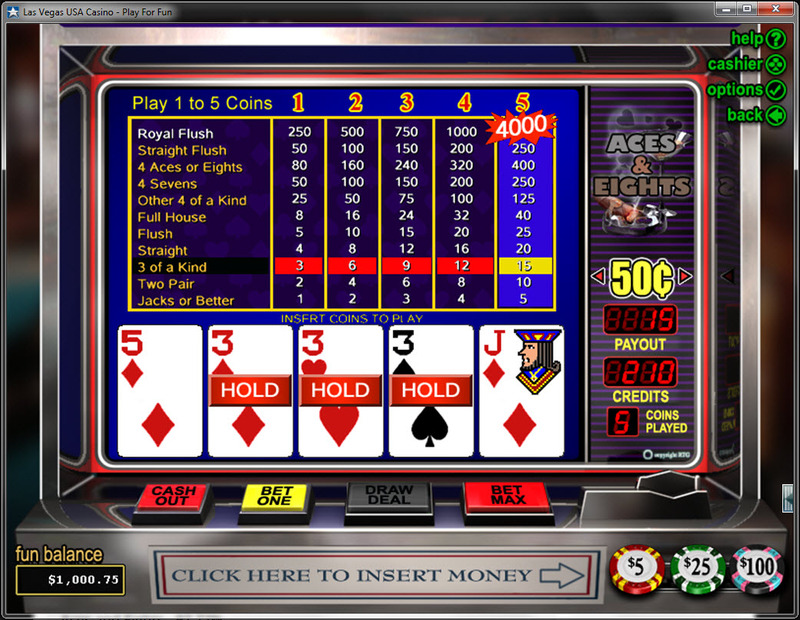 For all the details visit my section on Vegas Three Card Rummy. 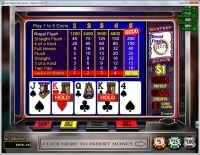 Real Time Gaming has lots of video poker games to choose from. 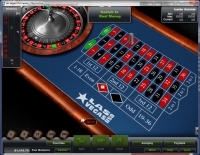 The pay tables are configurable, so they vary from one casino to another. 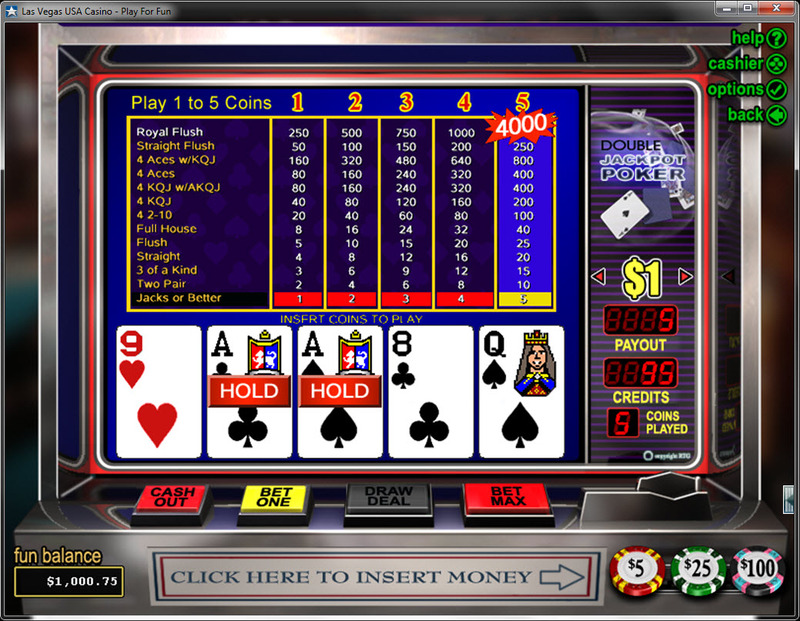 All conventional games are available in 1-play, 3-play, 10-play, 52-play, and 100-play. 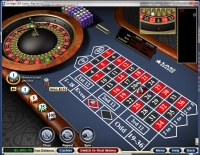 Often the pay tables are not as generous for any form of multi-play. 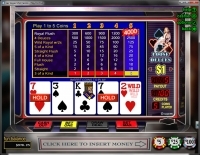 Following is a list of quantifiable video poker games available at RTG with known pay tables and returns. I'm sure other pay tables exist. If you know of any, please send me a screenshot. 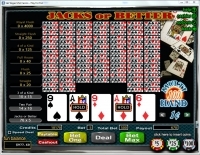 *: Double Jackpot and Double Double Jackpot are what is normally called Double Double Aces & Faces in land casinos. There are also two games I can't quantify. 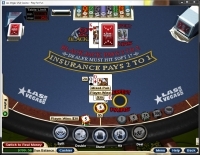 One is Mystery Bonus poker, where a randomly chosen pay is increased after the bet is made. 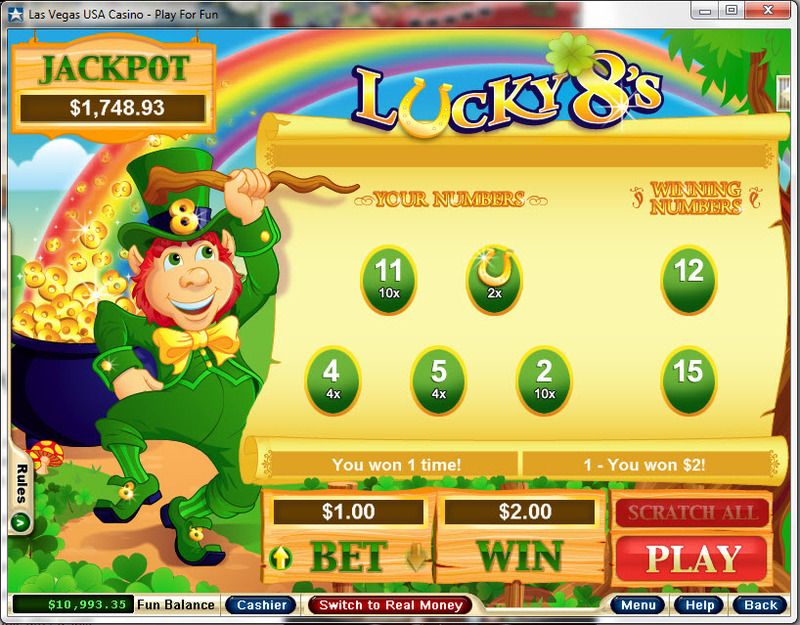 Without knowing the probability of each bonus and amount, I am unable to quantify the odds of the game. My request to RTG for this information was not returned. 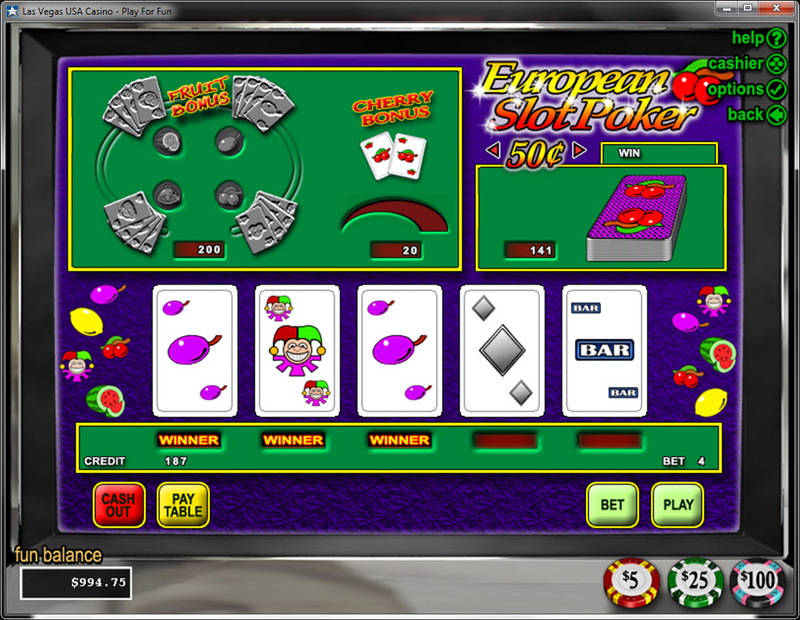 There is another game called European Slot Poker. I have to give RTG points for creativity for that game. Regarding strategy and math, you're entirely on your own with that one! 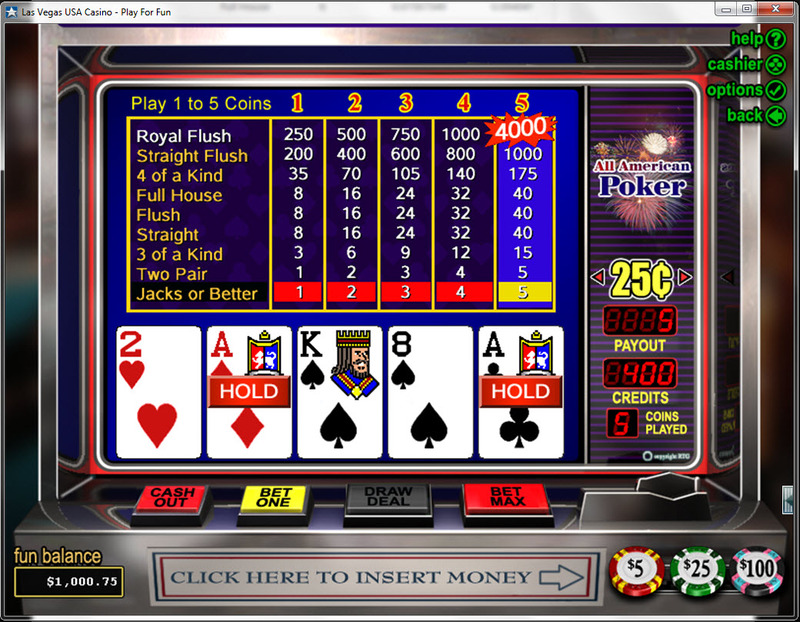 Finally, the thing I find most annoying about RTG video poker is the player is prompted to make a double or nothing bet after every win. I think there should be a way to say "No, and don't ask me again."